The NFL regular season is more volatile on a week-to-week basis than the Stock Market. A team that lost by several touchdowns one week can follow up with a blowout victory the next. Players who are responsible for the blame one week could be responsible for a game-winning play the next. With Week 6 in the books, let’s take a look at three AFC West players who saw their stock rise, and three AFC West players who saw it fall. Rivers set fire to the Chargers’ passing records against the Green Bay Packers. He set new high marks for completions (43), attempts (65) and passing yards (503) in Chargers’ history. 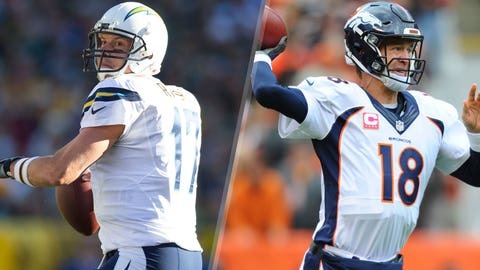 If he keeps it up, Rivers should be right around Peyton Manning’s single-season passing yardage mark by season’s end. Someone has finally emerged in the Broncos’ hunt for a lead runner. It’s Ronnie Hillman, who diced up the Cleveland Browns last weekend for 111 yards on 20 carries. He’s clearly outshining running back rival C.J. Anderson (41 yards) and should (key word: should) be in line for more work. The wily Broncos cornerback sideswiped a Josh McCown pass and took it 63 yards the other way last weekend. If that seems familiar, that’s because Talib did the same thing for a game-deciding score against the Baltimore Ravens in Week 1. Rivers did all the aforementioned record-breaking and still couldn’t get a much-needed win. He’s the only passer in NFL history to throw for over 500 yards with no interceptions and lose. It happened in heard-breaking fashion with his Chargers knocking at the door for an upset. Poor guy. The Chiefs might reenter the quarterback market if Smith’s inept play continues. His team needed a touchdown twice on Sunday vs. Minnesota. And twice, Smith failed to deliver — while missing a streaking Albert Wilson on a throw that could’ve stopped a five-game losing streak. Manning’s interceptions are way up. His touchdown tosses are way down. And once again, the Broncos defense (and not its legendary quarterback-led offense) needed to come through to save the day. Manning’s job is saved by his pedigree and his team’s unblemished record, though.